I made this Embersilk Cloth Farming guide to help out players who want to farm the cloths instead of buying them from the Auction House. I decided to search for places with high density of mobs which I can kill and drop [Embersilk Cloth]. I traveled around Azeroth, and after a while I made a list of places. Before you start farming, go to the Auction House and buy a [Potion of Treasure Finding] or make one for yourself if you are an Alchemist. With this potion you gain the chance of looting [Tiny Treasure Chest] which contain Embersilk, Volatiles, and gold. Gold is a guaranteed drop, while the other two just have a high drop chance. [Cloth Scavenging] also works on Cataclysm mobs. You can learn this skill by completing the Cloth Scavenging quest, which is given by Charles Worth at Dalaran (Northrend). This NPC exists in Broken Isles Dalaran too, but he won't teach you Northrend Tailoring. You will not be able to farm at The Bastion of Twilight if you don't have a high level character, so scroll down to the bottom of the guide to find alternative farming places. It's really easy to solo for level 100 players but it's doable for most classes at around level 95 too. Don't go there if you are below level 90. 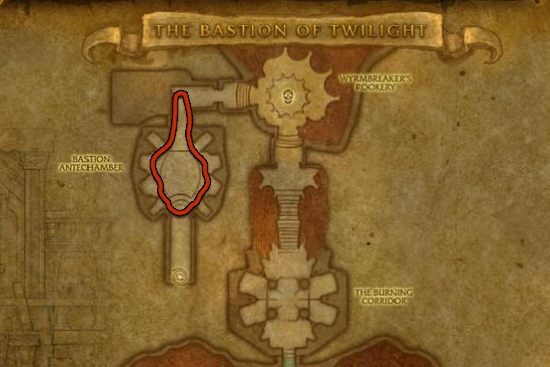 Gather every mob in the marked area, kill them all, loot, and run out. Reset the instance by right clicking over your own portrait and click "Reset all instance". You can only reset an instance 10 times in an hour. Don't kill the first boss or you can't reset the instance! The Restless Front is the best place to farm Embersilk if you can't solo The Bastion of Twilight. You will see the Restless Soldier and Restless Infantry bash each other to 19k health, which means it is easy to kill them. The respawn rate is high, you will never run out of them. I'd like to add that not every mob drops Cloth, and I've seen some drop 4 and some drop 1. The Twilight Gate in Twilight Highlands is also a really good place to farm Embersilk Cloth. Start killing Twilight Ettin, Bloodeye Magelord and Bloodeye Brute. These guys hit hard, don't pull too many of them.